MOTODRY’S Velocity jacket is made of 600 denier heavy duty polyester construction and twisted twill material with a ‘Reissa’ 100 per cent breathable / waterproof membrane. 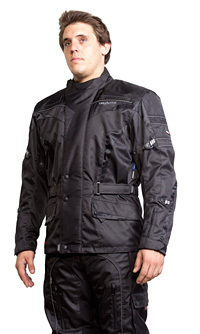 It has a removable / washable quilted liner as well as CE approved body armour and heavy duty foam back protector. The jacket features 1680 denier ballistic reinforced shoulder and elbow panels with a soft velcro neck collar. There are front and rear visualite reflective panels as well as rubberized easy pull velcro tabs and multi adjustable arm straps. There is a velcro waist strap as well as two external water resistant pockets, internal security pocket and rear storage pocket. Seams are double stitched with genuine YKK quality zips and rubberized snaps. The jacket is ¾ length and designed for winter comfort.